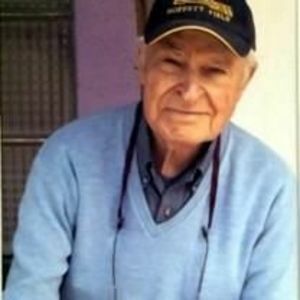 Arnold M. (Arnie) Rosenwald, 92, a retired standards engineer, safety coordinator and Air Force Veteran, passed away Tuesday, October 31 in Pacific Grove. Arnie was born July 23, 1925, in Boston, Mass. In 1964, his family of four voyaged west to explore new horizons. After a rewarding 25 years in Silicon Valley, (20 years of which serving Varian & Assoc.) Arnie and Sally / Soralie, (wife of 51 years) made Pacific Grove their new home in 1992. Arnie lived in P.G. for 25 years. He volunteered at the Meals-on-Wheels Auxiliary for more than 23 years, delivering 22,641 meals to homebound seniors and others. Together with Sally, they were named as Outstanding Senior Volunteers in 2001 by the Volunteer Center of Monterey County. Known as a warm-hearted "giver" and positive, pragmatic optimist, Arnie was devoted to family, home and friends. He is remembered as loving, genuine, kind, generous, caring, nurturing, smart, wise, honest, loyal, determined, organized, methodical, a great listener, enthusiastic, proud yet humble and endlessly curious. As a life-long learner and avid reader, Arnie thrived on countless courses, classes, lectures and seminars from M.I.T. 's Lowell Institute, Stanford, Toastmasters, Gentrain Society and B.S. degree program: USF. Later, he particularly enjoyed several "History of Civilization" courses at Monterey Peninsula College. He was pleased to meet people, see and learn about places (traveling the U.S. and abroad); history; museums; planes and air shows; oceans, seaport towns, carriers and tall ships. Arnie was ever ready for good conversations and discussions, good movies, theater, music and flower gardening. He savored great food, morning coffee and DARK CHOCOLATE! "TRY IT! It will probably work out. If not, you learned something." "DON'T BE TURNED OFF by the negative outlook of others." "CONDITIONS CHANGE - try it again!" He is survived by two daughters, Carrie Miller (Roger) of Pacific Grove and Ellen Black (Jim) of Citrus Heights; six grandchildren; six great-grandchildren; nieces and nephews. As no formal service will be held, the family suggests remembrances be sent to the Meals-on Wheels Auxiliary, 700 Jewell Ave., Pacific Grove CA 93950 or to any charity of choice. Heartfelt thanks to all for the compassionate care and support given to Arnie and family by Katya, Lauren, Jeanette and Marquita of VNA & Hospice and to Whitney, Doris and Pauline of The Paul.